We are pleased to announce our participation at the Conference Difficult issues in labor law, event organized by the Society of Legal Sciences. 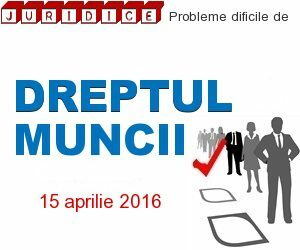 The event will take place on April 15 2016, starting at 10.00 at the Romanian Chamber of Commerce and Industry. The participants aim to clarify labor law issues whose difficulty was highlighted in practice. The conference approach controversial topics, offering legal solutions to difficult law problems. At this event will participate many professionals in labor law. More details about the event can be found by accessing organizer web page.